Take both the flours in a bowl along with butter & required quantity of salt & mix it well. 1. Make stiff dough with a help of water & let it set for about an hour & a half. 2. To make the filling, take a frypan & add about 3-4tsp. (Or enough to stir-fry) oil & add all the vegetables. 3. Stir-fry the vegetables till it is done well. 4. Add Soya sauce & salt at the end & fry it for 3-4 minutes on the stove. 5. Make lemon size balls out of the dough. 6. 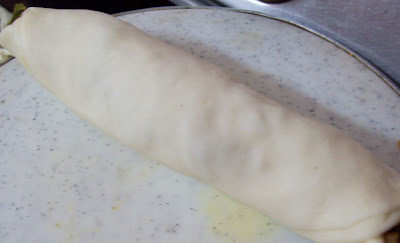 With the help of a rolling pin roll the dough as big as a chapathi. 7. Take 2-3 spoons of the filling & spread it lengthwise. 8. Now roll the dough till it reaches the other end & seal it with the help ofbutter. You can seal the edges (side edges) too with the help of water. & Deep-fry till it turns golden brown. 9. Dry it on a paper towel. 10. After 10 minutes, using a sharp knife you can make 2-3 pieces out of a single roll. Repeat the same with the remaining dough. 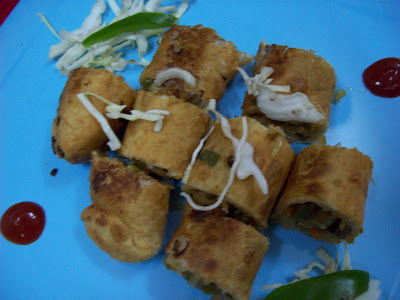 There is a suprise waiting for u in my blog. Check it now. Thank you friends for your sweet comments. Purva & kitchen FlavourThank you for remembering me and for passing award to me. Iam honoured. Thankyou so much. thanks 4 commenting on non veg even though ur veg..i really appreciate..